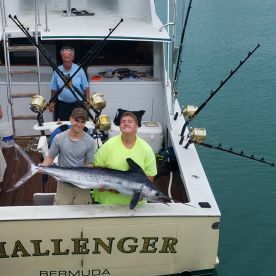 Father and son team, Captain Alan Card and Captain Ian Card, run Challenger Charter Fishing Bermuda. Capt. Alan has over 40 years experience in the charter boat business. Ian has 21 years in the business. Winners of the 1993 Blue Marlin World Cup Championship and the Inaugural Bermuda Big Game Classic 2001 .Capt. 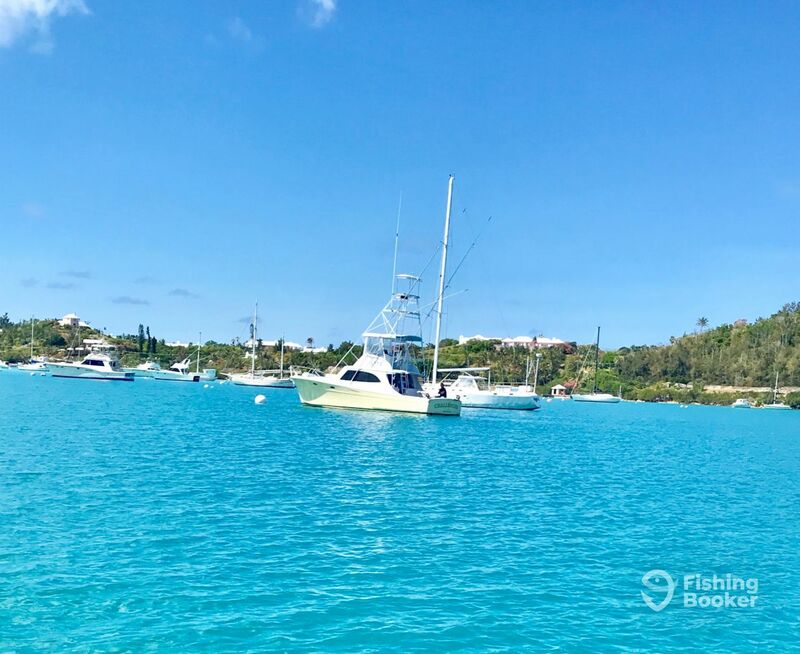 Alan has to his credit six of the largest Blue Marlin taken in Bermuda’s waters, weighing over 1100+ lbs. 11301/2 lbs. (1983); 1190 lbs. (1989); 1195 lbs. (1993); 1153 lbs. and 1162 lbs. (1995); 1199 lbs. (2002). Added to this list is the largest Bluefin Tuna 782 lbs. As a couple, off shore fishing is one of the few things we have in common. We fish offshore in North Carolina. Booking a fishing trip while were in Bermuda for our anniversary was our #1 priority, as we book our vacations based on if it is a fishing destination or not. The Challenger + Card Family, was recommended to me through a local boat builder in NC, who met the Card’s while in Bermuda a few years ago. We excitedly booked our trip, and we are glad we received such a great recommendation. The day before our charter, we rented a motorboat from H20 motorsports, and while we were passing through we saw the Challenger in the water. I am an extremely social person, and made my husband take us over to introduce ourselves. I get very excited. Ian and Alan Card were super friendly, especially as a strange boat with strangers on it pulled up randomly ;). We talked with them briefly, and set up plans for the next day. It made us even more excited, because they were so friendly. 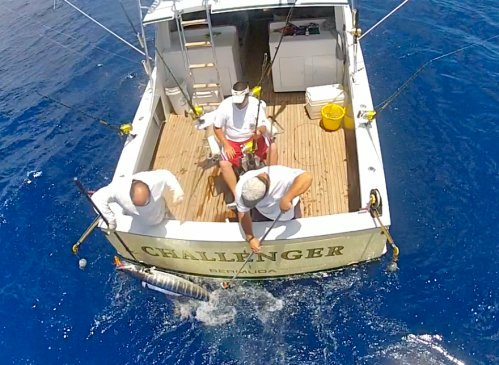 Upon arrival to the Challenger, we boarded the boat and my husband and Ian quickly connected as they talked fishing talk. My husband can go on and on talking about fishing, so I knew he was happy.Throughout the entire day Parker + Ian exchanged fishing stories. 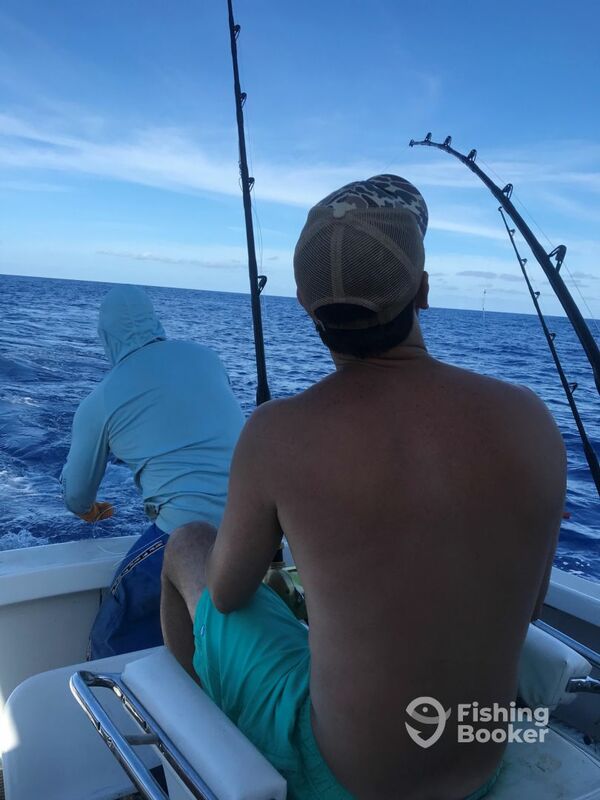 We fished 5/21/18, and the Blue Marlin were not in season yet in Bermuda, but Parker wants to come back to Bermuda to fish with the Cards on the Challenger when they are in season. 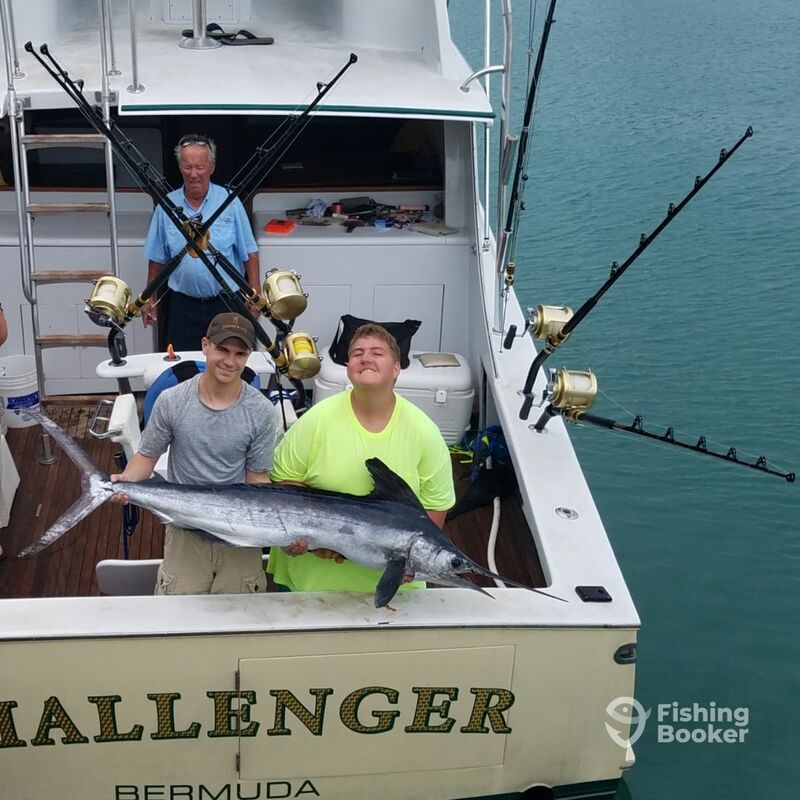 We trolled and caught wahoo and barracuda. It’s always an exciting moment when the reel screams and you hear ‘fish on’! The Card’s tell you to make yourself at home on the boat, and I did feel right at home. They had beer, water, soda available. I helped myself to a full day of Bud Lights :). The boat was extremely clean, and well taken care of. On top of the hospitality, fishing, beer, the icing on the cake was Ian’s music playlist. He played the best music all day, and it kept surprising me from Country, Classic Rock, etc. We spent a full day celebrating our wedding anniversary with the Card’s and would 100% do it again. I am hoping to fish with them in the near future again! from the welcome to the very end the captain and crew treated us a unique Bermudian experience. They answered all of our questions and made us feel very comfortable for the entire trip. They know their business and we caught fish. They were at all times very professional and yet very easy to be with on a five hour tour that took us sixteen miles our from this incredible beautiful island. The experience and knowledge of this crew gives the trip extra umph. 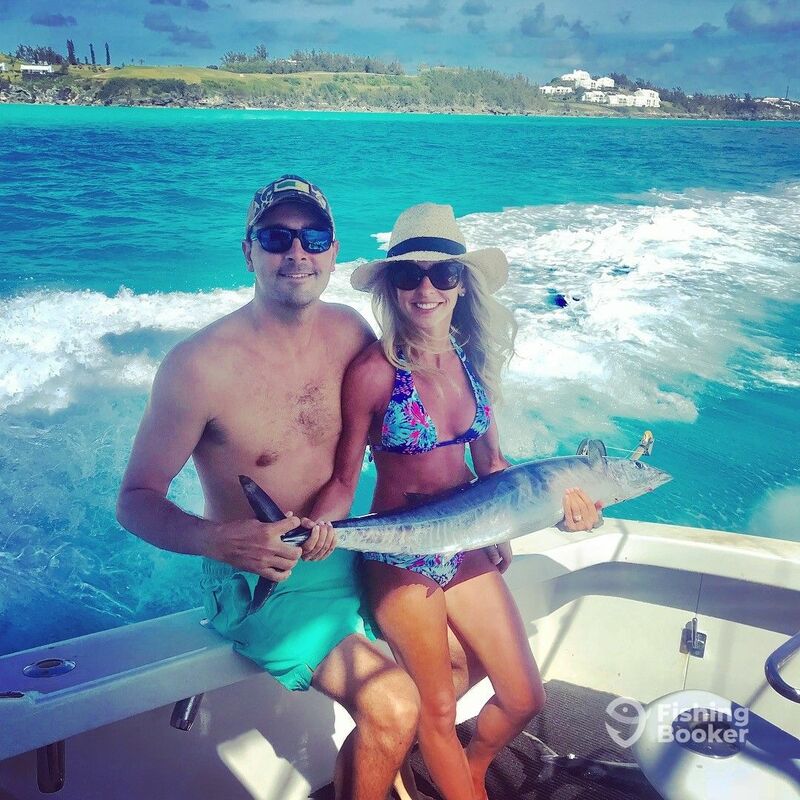 Go with these guys when in Bermuda. Capt Alan and Ian were absolutely wonderful! I can’t recommend this company enough. I have a special needs son, and they were exceptionally helpful and attentive. 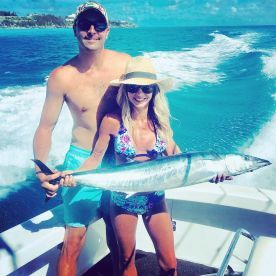 And he even caught a 7’ white marlin! Completely worth the cost and a day in Bermuda. The memory of a lifetime for our family! Great trip with a great captain and first mate. We had a great day fishing with Alan and Ian. 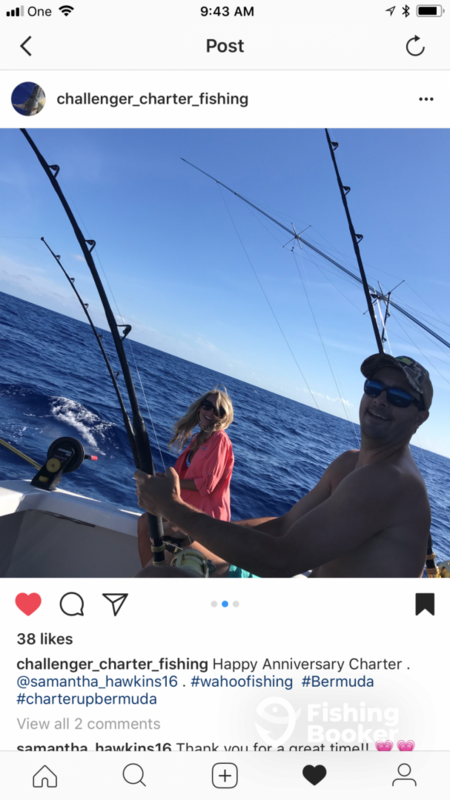 Alan put us on the fish (3 good sized wahoo and a missed blue marlin) and Ian did a great job working the lines. We will definitely use them again next time we are in Bermuda. Great time! They knew the spots to go and had the gear to land some fish.